Wow, a tremendous response from some of you who are following my restoration articles! Thank you all for your kind words and support! For those of you just joining us, we’ve been discussing how to refurbish an old Stanley #4 hand plane that I inherited as a family heirloom. If you have missed part 1, part 2, or part 3, feel free to go back and read them. I’ll wait….. 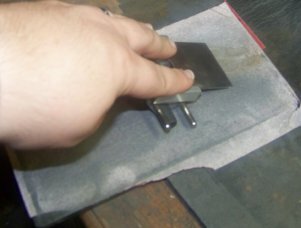 Some of you may have noticed in part 3 that the plane iron was cutting really rough, despite having trued all of the surfaces of the plane so far. The reason is that not only was the iron not all that sharp (like yours truly at times), but the angle of the cut was not optimal. As if that weren’t bad enough, the angle was not homogeneous all the way across, and there was a small knick in the edge. 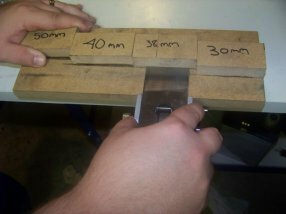 A jig for measuring the distance between the edge of the honing guide and the edge of the iron. 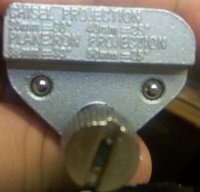 The reason we use the honing guide, is because like most of you visiting this article, I CANNOT judge angles by eye for sharpening, and, honestly, people that claim they can are, in my opinion, cheating themselves out of sharpening accuracy. Do what you want with your tools, but mine will be using the guide :-). 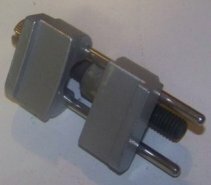 Anyway, if you take a look at the side of the honing guide, there is a legend that tells you the space in between the end of the guide tool and the tip of the tool that it takes to achieve a desired angle (feel free to do the necessary trigonometry if you don’t wish to use the legend). Since the bevel on my iron was so messed up, I had to do this twice. 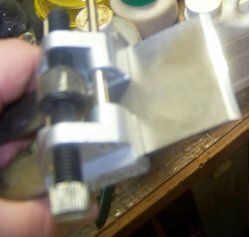 The first time was to make the angle homogeneous, and since a bit more material was removed than anticipated, I re-gauged the distance on my stop block jig and then went across the sandpaper/glass again just to make sure the angle was correct. 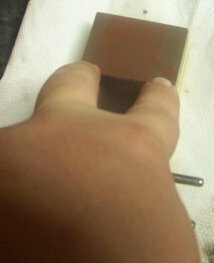 Once the angle was correct, I finished the bevel off on some 400 grit and 600 grit wet sandpaper to polish the blade a little before I moved to my 1000 grit/6000 grit water stones. At this point, we have a nice, consistent bevel worth putting a cutting edge on. To do this, we turn to the water stones! Personally, I would like to take these down to 8000 grit, but there’s only one company who makes a combo wetstone, Norton, and I haven’t been able to quite stomach the 75-something-dollar price tag, especially since the water stones I have are still in good shape. Maybe in the future, but if it’s in your budget, go for it. Let me move on before I go too far off into that tangent. A good practice that I like to adhere to is to keep the stones soaked in water, so they are ready when I need them. Otherwise, you’re looking at soaking them for at least 8 minutes before use. I use one of those disposable tupperware containers, and it seems to work well, but a lot of water stones will often times come with their own “wet storage” containers. Now, we’ll set up shop on “ye olde workbench” with the water stone and my spray bottle of clean water handy, and at the risk of sounding as long and drawn out as a Joseph Moxon text, I’m going to try to explain how to get a razor sharp edge on to the plane iron. First, we need to put a slight back bevel on the back of the iron, spacing it at around 1 or 2 degrees using a thin strip of metal (I harvested this one from an old sheetrock mud bucket I threw away, but a lot of people use thin metal rulers for this). Why do we have to bevel the back of the blade when we’re cutting with the primary beveled side? The easy answer is that it (theoretically) improves your cut by slightly decreasing the cutting angle. Right about now, you may be saying “Eric. Stop. You’re losing me here”. All’s I am saying is that we’re back beveling the edge in order to have a slightly steeper angle and reducing the amount of blade contacting the surface of the wood, thus making for a smoother cut by reducing cutting friction. 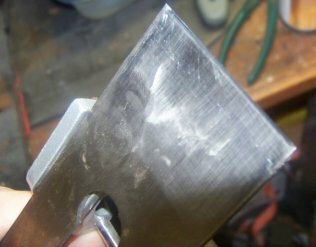 Now I can hear you saying, “Well, why don’t we just grind the primary bevel at a steeper angle if we’re just reducing surface area?” The answer is, it inherently makes the blade weaker by doing that. The metal of the iron has less structural support and becomes flimsy. Okay… “Well, what’s different about the back bevel then?” We’re accomplishing the goal of an “effective angle” by using a small compounded angle on the backside, leveraging the tensile strength of four compound surfaces instead of three. In essence, it helps split the forces from the cut a little better by sharing the load in different directions. As a layman’s comparison, think of a bridge with circular pillars where it meets the water of a river. They aren’t square because it would take a stronger material to absorb the force of the rushing water. By changing the shape, and adding more directions for the water to contact, we accomplish the goal of dissipating more force with the same amount of material. The magic of applied physics is a fantastic thing. I’ll move on now, I can see you’re growing tired of this discussion. Now, we just flip the blade over, and return to the 1000 grit side. With the honing guide set, and using methodical strokes from the far end of the stone to the near side, run the bevel across the length. Do this slowly, taking your time to ensure the blade stays flush and fully contacting the stone. Eat your heart out, Moxon. This will give you a slight curvature to the plane iron that greatly increases cut quality. I’m talking the kind of ease in a planer that would make your mother so proud she would cry. And with that, our planer has been fully refurbished. For those of you who do not know how to adjust your planer for operation, I will be coming out with a supplemental on that very shortly. Otherwise, I wish you the best of luck with your woodworking endeavors, even if they do not include rehabilitating an old, worn out heirloom. Oh, in case you were wondering how it cuts, well, see for yourself! A very nice presentation and just in time to use with the $3.50 realllllllllly rusty Stanley #4 (type 11) from an Amish flea market here in PA. Thank! Great find! Best of luck in your restoration efforts. If you run into any issues, let us know and we’ll do our best to help out between napping from those gas station hot dogs we love. So, my plane I’m restoring won’t hold the settings, besides the screw that tightens the lever cap not being tight enough, what could cause the iron to not stay put when I go to plane.